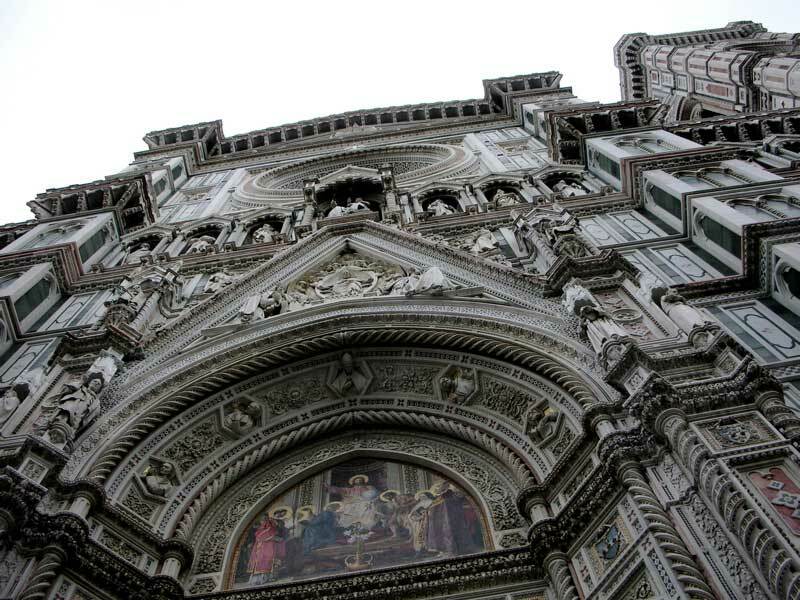 When we lived next to Santa Croce church, I used to never see the Duomo unless I was walking down via Calzaiuoli. But, even then, I'd only really see the Duomo if I went to Pegna or the Paperback Exchange bookstore. I get to see the Duomo almost every day now when I walk out to via dei Servi to go to via Calzaiuoli. This evening I had to go downtown to fare delle commissioni (run some errands). Things have been going a million miles a minute for the last few weeks. We changed apartments, we went out to get things for our new apartment, and we had our first party. On Monday morning when I woke up, I decided I wasn't going anywhere. And, yesterday, I felt the same. I didn't leave the apartment for two days and it felt great! This morning; however, I finally decided to go outside. This entire week I had been stressing out about our aperitivo (appetizer party). Every day I had something to do for it. I invited about 30 or so people and then had the fear that they would not all fit into our apartment. 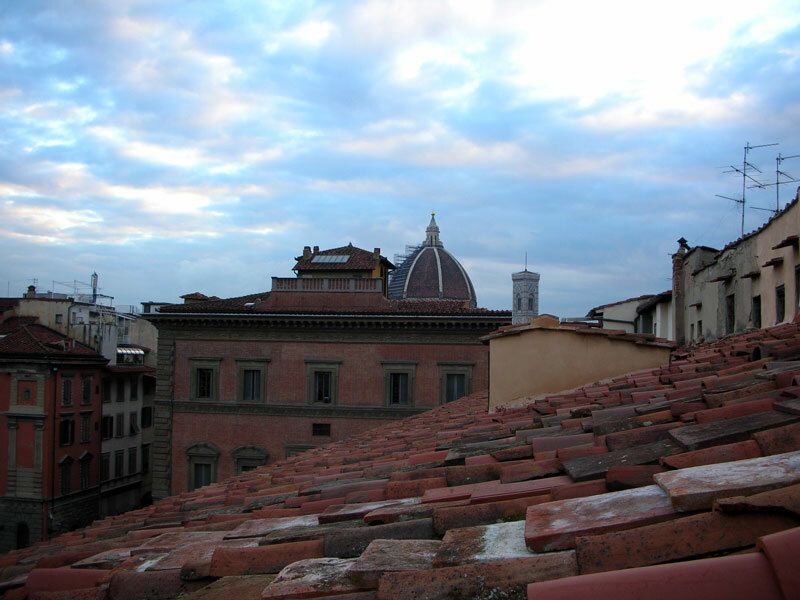 The weather has been rather cold in Florence, so standing out on the terrazza (terrace) wasn't an option. The only thing we had on the terrazza was Christmas lights, a stella di Natale (poinsettia) on the table and bottles of spumante (sparkling wine) to keep them cold. After we moved, I had thought of going back to my old parrucchiere (hairdresser), but I figured that a change would be good for me. I liked my parrucchiere because he was very nice to me. We used to talk about traveling and restaurants every time we saw each other. The only issue I had with him was that he never told me his name. I only found out his name through a friend of mine who sees him as well. I just thought he could've introduced himself to me, but after seeing him for almost two years, I realized it was probably my fault for not asking him. At our new apartment, we have a brand new flat screen HD televisore (television set). We were so happy to have it because we imagined ourselves having a few friends over for movie nights. We knew that even if our apartment didn't have one, we'd buy one anyway. We were a little sad when we did our walk-through of our apartment and saw that the televisore didn't work properly. Florence is all lit up: via Calzaiuoli as well as a few other streets perpendicular to it have lights hanging between the buildings to light up the street below. Many of the shops are decorated for Christmas as well with lights and decorations. Even though the weather is a little brisk, most people seem quite content walking in centro (downtown) with all the festive decorations. 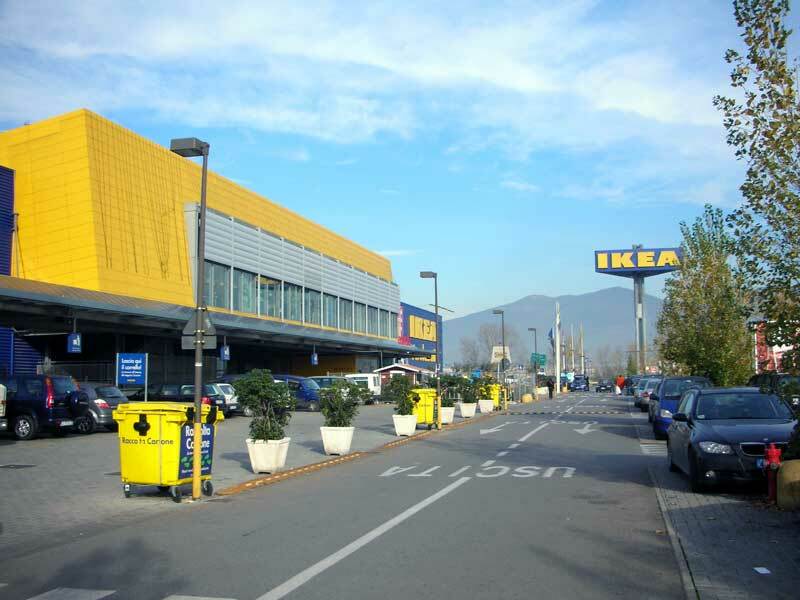 Now that we are in our new apartment, we've been to IKEA three times in the last three weeks. Once, before we moved in, Simone drove us there and we bought some things that we knew we needed. And this week, we've been twice: Monday and today. Simone wanted to join us both times, but was too busy fixing his place up. Last night I went to see a production by the Florence International Theatre Company (FITC), called The Eight: Reindeer Monologues with Dave and my friend Sara. I had been wanting to go see it because I had heard so much about it. I wanted to go when the author Jeff Goode will be in Florence next week, but Saturday night seemed easier for us all. Last night when I peeked out onto the piazza, I saw that they were marking the ground with chalk. It looked like there was going to be a small mercatino (small market). I was so excited that I couldn't wait for morning. 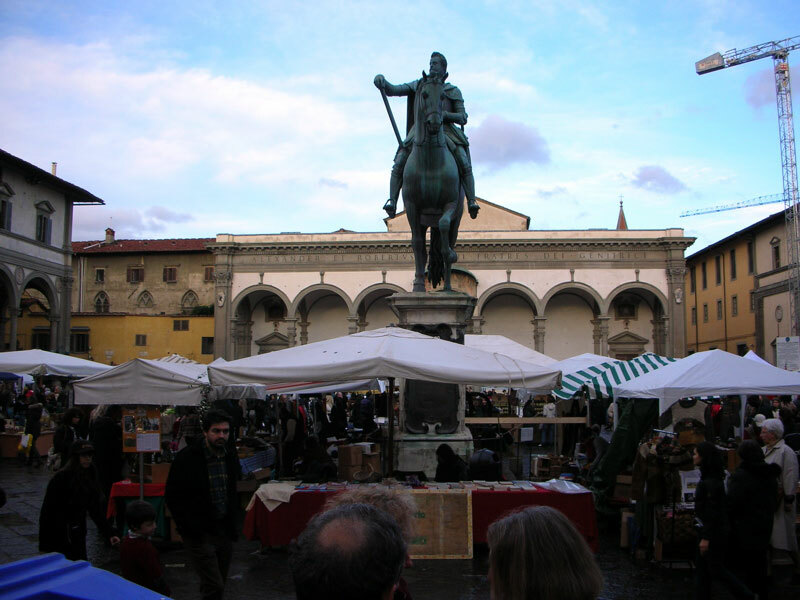 Today is the Festa dell'Immacolata Concezione (Immaculate Conception Holiday), so most people don't work in Italy although many shops downtown were open. 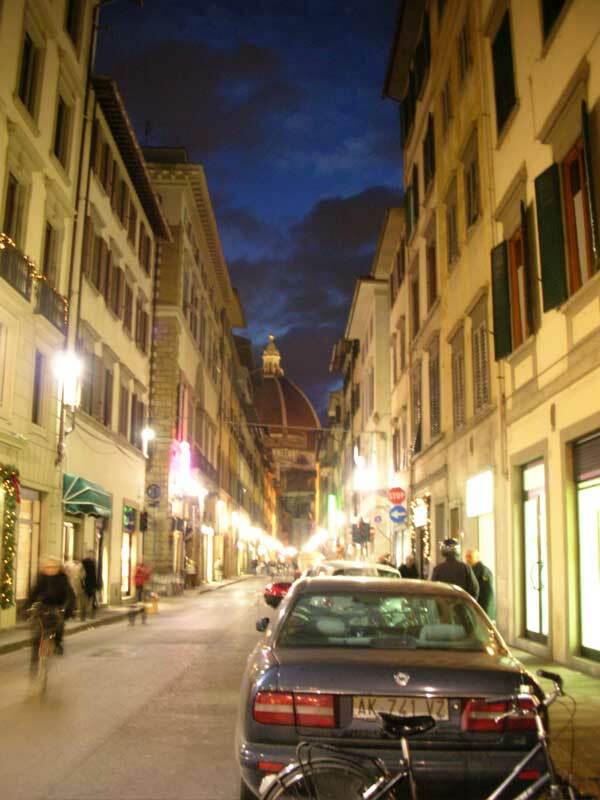 Via Calzaiuoli was so busy that we had to take the back streets and walk behind the Duomo to get to via dei Servi. After last night's heavy storm, we woke up this morning to clear blue skies and warm temperatures. For most of the day, the sun was shining on our city. As the sun set this evening, I went out to our terrazza (terrace) and took this picture. I caught it at the right moment because just a few minutes later when Dave joined me, the sun continued to set and the sky became a little darker. For the past few days, I've been looking at all the corniciai (frame-makers) around town to get my two dipinti (paintings) framed. Most of the corniciai that I have seen do very nice cornici (frames), but not for the style of dipinto that I have. I saw two corniciai: one in via della Pergola and one in via S. Egidio yesterday when I was walking by, so I decided to bring my two tele (canvases). I know that I am fortunatissima (very fortunate) and I thank my lucky stars every day. 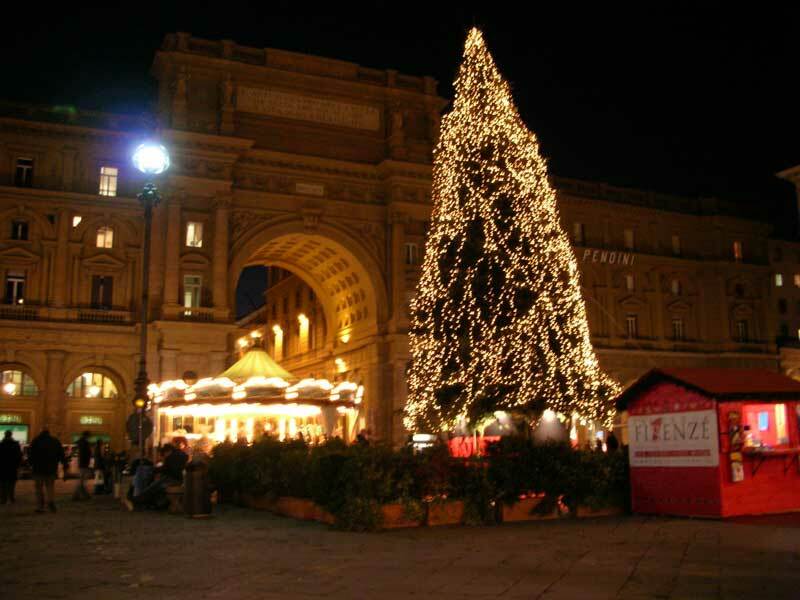 And, I don't feel it's just because I live in Florence although Florence is a big part of my life. This afternoon, however, I was walking back to our new apartment and I realized just how fortunata I really am. I walked past the Duomo and wondered about all the people who travel so many miles to come here and stand where I was standing when I took this picture. Today was our first normal day in our new apartment. Last Friday didn't really count because we still had boxes all over the place. I didn't think that such a small move in the same city would be so huge for us. We changed supermarkets, local shops, and even palestre (gyms). Now that we have sistemato la nostra casa (arranged our house) most of yesterday, we were able to do a little bit of shopping today. Being that we're getting close to Christmas, almost all of the shops downtown are now open on Sundays. There seem to be many people roaming the streets in our area. I've known that Esselunga delivers groceries to people's apartments in Florence. I've been wanting to try it for a long, long time, but each time I thought of it, we were just about to go on a trip and we didn't need any groceries. But, once we got our new apartment, I was determined to give it a try.